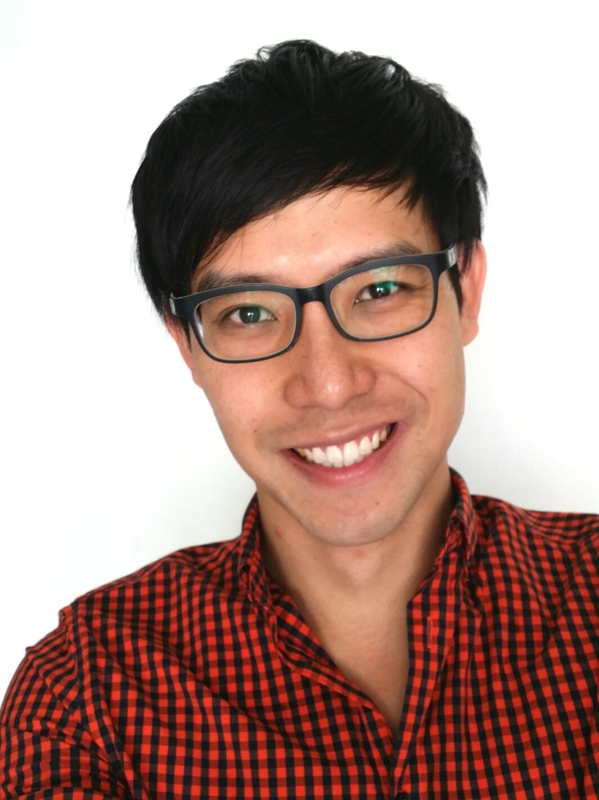 Why Should Singaporeans Have to Face “Restrictions” For Lower Housing Prices? The Straits Times had also reported that, “The cheaper flats would have to come with restrictions to differentiate them, so that current flat owners would not see their values plummet overnight.” The Straits Times had reported on possible restrictions such as by, “Selling a cheaper class of flat on a shorter lease such as 60 years, as opposed to the current 99 years (which) would be the easiest way,” “extend(ing) the number of years that a buyer has to stay in his new flat before he can sell it” or by selling the flats back to HDB. First, I applaud the move to reduce the price of new flats from 5.5 times the current annual median salary to four times. However, I disagree with the approach – why do flat owners have to put up with “restrictions” for new flats, to purchase new flats which are finally more priced at a more appropriate level, than when they were overpriced at 5.5 times? But why should Singaporeans bear the costs of inappropriate pricing policy pursued by the Housing & Development Board? If “restrictions” are put in place to reduce the worth of the flat, what difference would it make to reduce the prices of the new flats? The inherent problem is that prices had ballooned, because of two factors – first, over-speculation and second, wages which did not grow in tandem with the rise in housing prices. In terms of over-speculation, the government took too long to put in effective policies to curb the growth of prices. However, for the purpose of this article – why did the government not address the lack of growth, or the stagnation of wages, in the discussion of housing prices – when they have pegged the housing prices to median incomes? 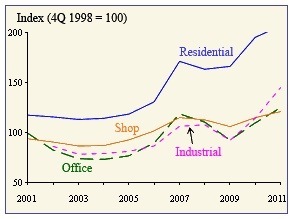 In Chart 2, you can see that the HDB Resale Price Index has also grown immensely from 2002 to 2012. I am not able to locate the housing price index for new flats. Now, take a look at Chart 3. 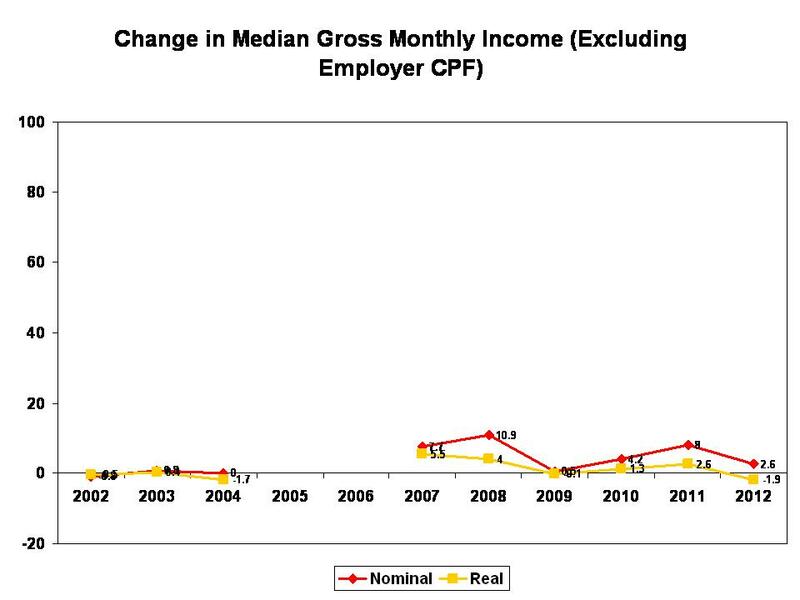 You can see the change in median gross monthly income. There wasn’t much growth. 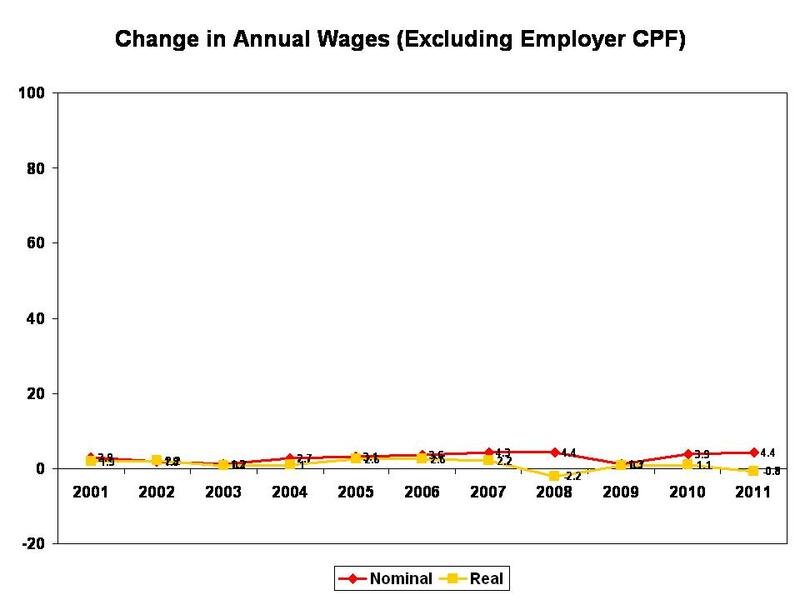 In Chart 4, you can see the change in annual wages. Again, growth plateaued. The charts speak for themselves. Whereas housing prices grew tremendously, wages remained stagnant. Back to the question – why should the people shoulder full responsibility for housing prices which inflated because of bad government policies? Why should the people have to bear with “restrictions”? The people have been warning the government of ballooning housing prices for years, but this has fallen on deaf ears, or if they were heard, the government had reacted far too slowly. 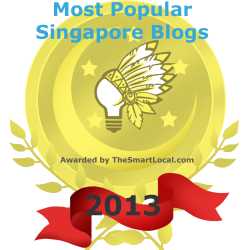 Granted that some Singaporeans and other residents in Singapore were party to the growth of housing prices, due to their price speculation of private and resale housing prices. But the flaw in this was that the government allowed HDB prices to be pegged to private housing and to be dragged upwards. What the government should have done was to have clear markets, and ensure that the prices of public housing was not led astray. The government did not responded when it needed to. And now, the government expects the people to bear the brunt of the government’s mistakes. But more importantly, if indeed housing prices are to be brought down from 5.5 times that of the annual median salary to four times that, why is it that the government has only devised the solution to “restrict” the type of housing we are able to buy? Why didn’t the government devise the solution to uplift our wages instead? Problematically, our wages were left to be stagnant while housing prices soared. Not only that, our wages were eroded in their value by inflation. 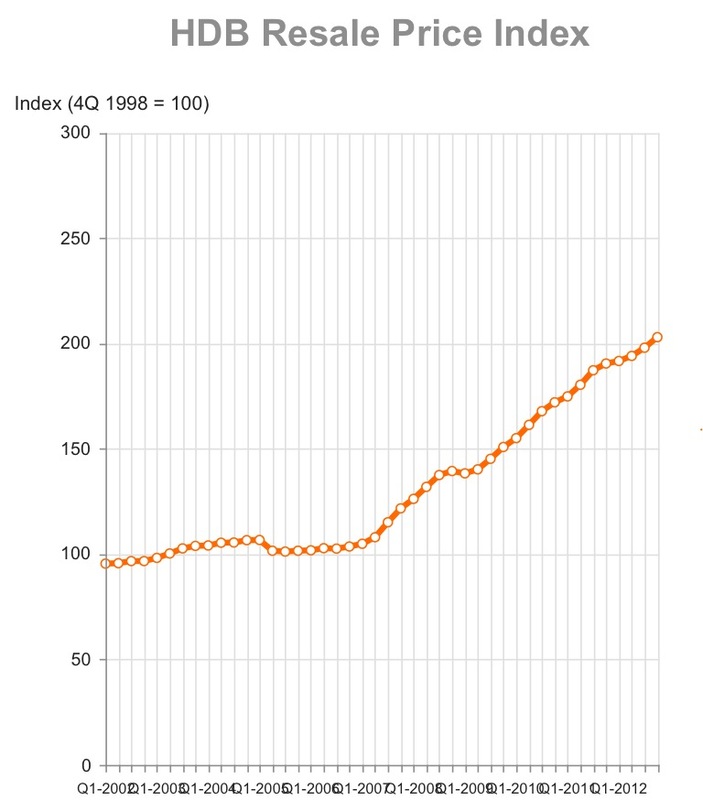 Most worryingly, as I had written previously, Singapore’s wage levels and purchasing power is the lowest among the developed countries, even as we are one of the richest. This is preposterous. There is a lot of room for our wages to grow, because they have been forcefully deflated. And if the government is not willing to pursue this, then it is in no position to force Singaporeans to have to compromise with “restrictions” forced on us. Prices of public housing have to come down, either through pushing prices down, increasing wages, or a combination of both. But until both approaches are used, the government should not force Singaporeans to compromise on their standard of living simply because of poor government planning and the chronic depression of wages. Restrictions make sense depending on what is on offer. If new HDB flats are sold at overall cost recovery, like what the SDP proposed, then some profiteering restrictions should be in place to ensure that future generations can get their flats at overall cost recovery and to ensure that those who have already bought flats do not find themselves in negative equity and have to lose their homes (thus losing years of savings). However, if new HDB flats are sold at perhaps “just” 3x the cost of construction and administration (I’m thinking 4rm-ers), then they are really selling the same expensive overpriced flat. What affordability? I didn’t address the issue of wages. I think it’s a rather complex systemic thing relating to the foreign labour influx, inadequacies of universities here and other things. Solving each of the problems in turn will help. But having a decent wage only masks the problem of housing unaffordability. We need to tackle both. Not one and ignore the other. I would rathet advocate a better quality of new estates, e.g.more differentiated built environment, and more variability overall. Could be linked to limits of space per occupant, which would also limit demand and thus reduce upward market forces.